US architecture firm SO-IL has continued its exploration of material skins that filter the air with a set of costumes for a musical performance during the Chicago Architecture Biennial, which opens to the public today. 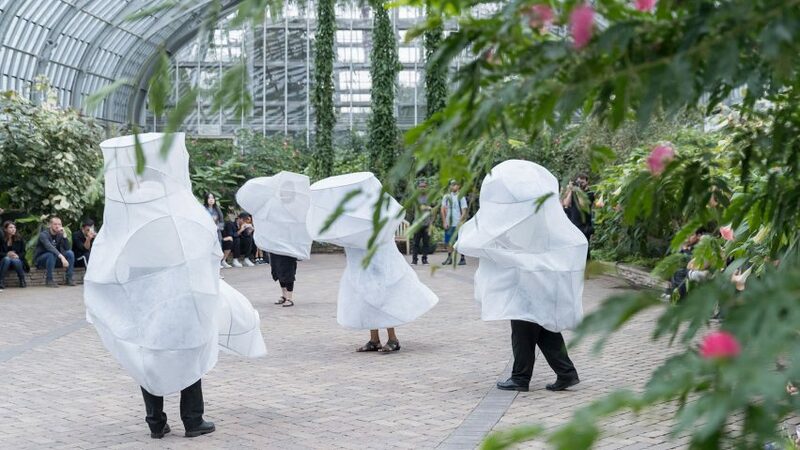 SO-IL collaborated with artist Ana Prvački to create the seven-minute piece titled L'air pour l'air, performed by four musicians from the Chicago Sinfonietta in the city's Garfield Park Conservatory. The team produced a set of enclosures for the body to be worn during the show, which are designed to filter the air around the performers as they play. The white structural costumes shroud the majority of the wearer, and are worn using straps over the shoulders and round the waist. They resemble scaled-down versions of a prototype house that SO-IL built for this year's Milan Design Week, which was also designed to filter air pollution. The firm's co-director Ilias Papageorgiou explains the project, completed in collaboration with MINI Living, in a movie filmed by Dezeen. Each of the costumes is shaped to accommodate the different musical instruments. The trombone player's has a low protrusion to make space for the long moving arm, while the flutist is given more horizontal space at head height. Of the two remaining performers, one plays the saxophone and the other is a vocalist. Together, they perform an original composition named De Aere (concerning the air) by composer Veronika Krausas. Portions of the garments are made from a gauze-like material so the musicians can see where they are going, but these areas look very similar to the white filtering material so it is hard to tell them apart from far away. During the performance, the quartet walk slowly around one of the verdant glazed halls at the conservatory, which was built in 1907 by landscape architect Jens Jensen and architects Schmidt, Garden and Martin. "The installation and performance encourage its viewers to meditate upon the complex notions such as the relationship between purity and pollution, and the distinctions between self, body, objects, and nature," said SO-IL. Previews took place on 13 and 15 September 2017, and public performances are scheduled for 3pm and 5pm on 16 September 2017 – the first official day of the second Chicago Architecture Biennial. L'air pour l'air is one of several satellite events organised around the biennial, focussed on the theme of Make New History chosen by artistic directors Johnston Marklee. The majority of the exhibitions are hosted at the Chicago Cultural Center, including a set of giant architectural models created as alternative visions for the famous 1920s Tribune Tower competition. The biennial runs until 7 January 2018. SO-IL also took part in the inaugural Chicago Biennial, for which the studio created a metal installation over a ramp at the cultural centre, where the majority of the programming took place. The project, named Passage, remained in place after the show ended.